Budget Technology: Kinde Basic vs Tolino Page: which is best? Kinde Basic vs Tolino Page: which is best? Online content management, in comparison to Amazon, is one area that Tolino is superior. Register for the Tolino Cloud and you can then read online in the browser, organise collections and upload books. The user interface is intuitive, and it is possible to view and change book covers. Amazon does allow online content management, but it is like a file browser in which the user can delete documents, add documents to collections and download documents. The Kindle Cloud Reader is not integrated into content management and needs access through an external website. The Kindle Cloud Reader also only allows access to documents bought from the Kindle Store. The Kindle Basic's software is superior to the Tolino Page. I have posted about Amazon’s software before, so this is a quick summary. Amazon offers a uniform software experience on all the current batch of e-readers (also, the earlier generation of the Kindle Basic, Kindle Paperwhite and Kindle Oasis all run the latest firmware). In Amazon’s firmware it is possible, for example, to bold text, look-up Wikipedia, translate words, utilise a vocabulary builder of dictionary look-ups and export notes in a notebook format. PDF support, in Amazon's firmware, is refined - it is possible to double tap to zoom, highlight/annotate, increase text contrast, decrease margins, and change orientation. In other words, it is a fully functional PDF reader. Tolino does support basic e-reading functionality but without many of the advanced features, you get with the Kindle Basic. Tolino Page's PDF functionality, like Kobo, is restricted to supporting a basic viewer and with no way to interact with the text. The Kindle Basic is zippier in comparison to the Tolino Page. The Tolino Page's performance is adequate, but you notice the difference when you put the two devices side by side. 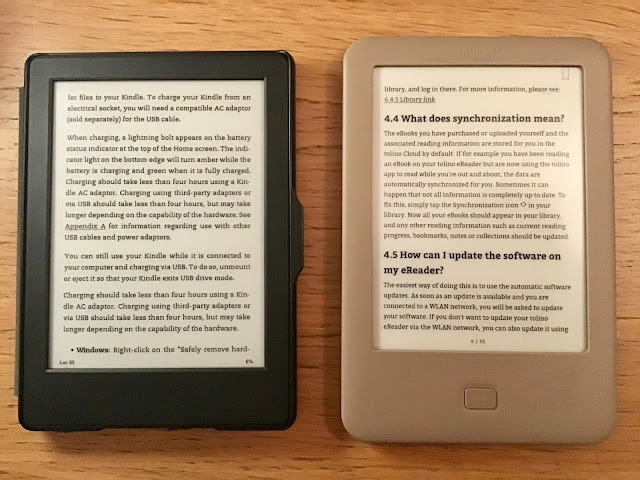 Both devices have the same resolution and despite the Tolino Page's E-Ink Carta screen, the text is darker on the Kindle Basic (see picture below for a comparison between the Kindle Basic and Tolino Page). This may seem odd, though less sharp, and blocky, I found the text on the Kindle Basic darker than the high-end Kindle Oasis (I will dedicate a post with further reflections on the Kindle Oasis. My review was positive but after prolonged use, there are some issues I will flag). Another plus is the relative lightweight of the Kindle Basic. The device weighs 161 grams. The Tolino Page is light too at 170 grams. The Kindle Paperwhite is significantly heavier than both devices at 205 grams. The lightweight makes the Kindle Basic a good companion when travelling or commuting. Overall, the Kindle Basic is hands-down the best entry-level e-reader from an established vendor. The device makes a great gift, an e-reader for children or something light to carry when travelling. Yet a qualification needs mentioning: there is hardly any choice, now, in the basic e-reader category. It is also not clear if the Kindle Basic will be phased out. With the Voyage gradually being dropped it is possible an updated Paperwhite will come at a lower price and this means the Kindle Basic might no longer be a choice. Of course, this is speculation.